What Are Early Warning Signs of ALS? Every year, nearly 5,000 people in America are diagnosed with Amyotrophic Lateral Sclerosis (ALS), a progressive neurodegenerative disease that affects nerve cells in the brain and the spinal cord. In 1939, ALS received a lot of attention when baseball legend Lou Gehrig was diagnosed. In 2014, the Ice Bucket Challenge once again turned the spotlight on ALS. According to the ALS Association, 150+ active research projects have been funded since the challenge, translating into new hope for patients around the globe and right here at Ochsner. Why the ALS Center at Ochsner? The ALS Center at Ochsner offers comprehensive care for patients with ALS and related disorders. Our team represents many specialties and uses a collaborative, multidisclinary approach to create personalized care plans. Our center is modeled after the national guidelines for care that have been developed by the ALS Association of America. In addition, we collaborate with the Louisiana-Mississippi Chapter of ALSA. 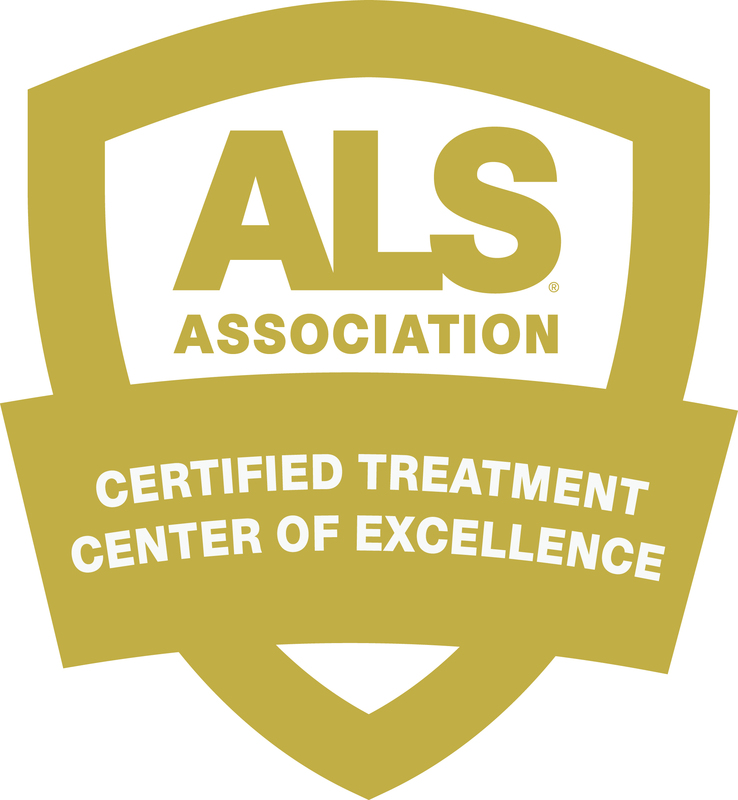 The Ochsner ALS Center has been designated as a Certified Treatment Center of Excellence through the ALS Association's Certified Center Program. At Ochsner, we understand the challenges our patients and their families face every day. The goal of the ALS Center is to provide you with the highest quality of care and services in one place. The center allows you to be seen by all of specialists in one visit, helping to alleviate the difficulties of traveling to multiple appointments throughout the month. Your ALS coordinator/advance practice nurse will discuss symptoms and current issues ahead of the visit to determine which specialists you will need to see. Ochsner patients with ALS are seen by members of our team every three months, on the first and third Wednesdays of the month. Our Center provides patients access to clinical trials and Ochsner's innovative Voice Banking program. New patients often have already been evaluated by a neurologist and may have been told that they have ALS or another neuromuscular disease. ALS Center neurologists have extensive training in the diagnosis and treatment of neuromuscular disease and conduct an initial evaluation of each patient. Diagnosing ALS requires physical and neurological examinations and a variety of tests to rule out other problems. The team at the ALS Center is here to offer diagnoses as well as second opinions. Blood and urine tests – Helps your doctor eliminate other possible causes of symptoms. Electromyogram (EMG) – Evaluates the electrical activity of your muscles when they contract and when at rest. Magnetic resonance imaging (MRI) – Produces detailed images of the brain and spinal cord. Muscle biopsy – Test to determine if you have a muscle disease other than ALS. Nerve conduction study – Measures your nerves' ability to send impulses to muscles in different areas of your body. While there is no cure for ALS, Ochsner provides treatments to help you live a productive and independent life for as long as possible. What’s more, our patients have access to future treatments through clinical trials. Rilutek is the only medication currently approved by the FDA to slow the progression of ALS. Our team may prescribe additional medications to address the symptoms such as constipation, depression, excessive salivation and/or phlegm, fatigue, muscle cramps and spasms, uncontrolled outbursts of laughing or crying, sleep difficulties and spasticity. Radicava™ (edaravone) is a treatment option for amyotrophic lateral sclerosis (ALS) that was shown to slow decline in the loss of physical function. Learn more. The ALS Center is located within the Ochsner Center for Primary Care and Wellness at 1401 Jefferson Hwy., just across the street on the north side of Ochsner Medical Center - Jefferson Highway. Convenient, free parking is available. Saving a voice starts with you! Amyotrophic Lateral Sclerosis is a debilitating motor neuron disease that affects patients’ ability to move, speak, and breathe. The Ochsner Medical Student Association ALS Voice Banking Project is dedicated to helping patients with ALS and their loved ones. The Ochsner Voice Banking Program was established as a way to record and preserve the voices of those diagnosed with ALS, after the ability to speak is lost. Please continue reading to learn how you can help us continue to achieve our mission: to save the voices of patients diagnosed with ALS. We are a group of students from University of Queensland School of Medicine - Ochsner Clinical School who are dedicated to helping community members with Amyotrophic Lateral Sclerosis (ALS). Our project helps record the voices of patients with ALS before they lose the ability to speak using ModelTalker software. We also work to raise funds and awareness to cover the cost of voice recording/creation of a synthetic voice for our patients. The Ochsner Voice Banking Program is a volunteer initiative that was developed in 2016 and is run by students from the University of Queensland – Ochsner Clinical School. The medical students help people with ALS by recording their voices in a specialized audiology booth. Once recorded, the voices are sent to the software manufacturer, ModelTalker, which synthesizes each voice for future use on any computer device through typed commands. ModelTalker is the incredible software company that creates synthetic voices for our patients. They have created a program of 1600 phrases that the patient reads, and we record. Once all of the phrases have been recorded, they are analyzed for quality and broken up into sounds and syllables to allow patients to form unique and original speech using their final synthetic voice. ModelTalker software is compatible with multiple systems and voice interface technology options. INTERESTED IN HAVING YOUR VOICE RECORDED? Our students are happy to schedule an appointment with you! Contact us at ALSVoiceBanking@ochsner.org if you are interested in making a voice banking appointment for yourself or a loved one. Appointments are typically available 8:00 AM, 10:00 AM, and 12:00 PM on Saturdays and Sundays at Ochsner Medical Center, 1514 Jefferson Hwy, New Orleans, LA, 70121. There is also availability at our Ochsner Covington location on Saturday mornings. If you are unable to make it to either of our approved locations but you would still like to record your voice, please let us know! We may be able to accommodate alternative recording locations on a case-by-case basis. Unfortunately, at this time we are unable to provide transportation. Recording sessions can last for up to 2 hours each, and patients typically require anywhere from 4 to 8 recording sessions to complete the program. Your donation allows us to raise money for patents for people with ALS to go towards the costs of voice recording and making a synthetic voice. If you would like to make a donation, please select "Support the Neuroscience Center of Excellence: ALS Innovation." Please email us at ALSVoiceBanking@ochsner.org if you have made a donation, so we can ensure that the funds are properly allocated. If you are unable to monetarily contribute to the Ochsner ALS Voice Banking Project, consider donating your own voice! While patient recording is our priority, you can donate your own voice by recording your own 1600 phrase voice bank, just like our patients. ModelTalker uses these donated voices for research, continuous program improvement, and for patients who are unable to record their own voice. For more details, visit https://www.modeltalker.org/donating/.